Since 1965, Halaco Engineering Company operated a scrap metal salvage facility located adjacent to the Ormond Beach Wetland in Oxnard. The facility melted millions of pounds of magnesium and aluminum into ingots for use in manufacturing and die-casting, and discharged over one million gallons of contaminated wastewater from its smelting operations into unlined settling ponds every month. The wastewater was contaminated with copper, lead and other heavy metals, ammonia, and several radioactive isotopes. Solids that settled out of the wastewater were piled onto a slag heap that grew to cover 26 acres and tower 40 feet above the wetland. According to the Regional Water Quality Control Board, the slag heap emitted ammonia and radioactive elements such as thorium and uranium-238. The unlined ponds leaked contaminated wastewater into the wetland, the ocean, and groundwater. The Ventura County Air Pollution Control District found significant cancer and chronic health risks from Halaco’s air emissions, which were violating the Clean Air Act. The District received hundreds of complaints from community members who suffered headaches, sore throats and other ailments from the fumes emitted by Halaco. The company had been cited repeatedly by regulatory agencies for releasing carcinogens into the air, leaking contaminated water into the nearby wetland, and dumping radioactive material into the slag heap. In 1980, the US Environmental Protection Agency (EPA) determined that Halaco was violating the Clean Water Act by, among other things, discharging waste to the Ormond Beach Wetland. However, Halaco failed to develop appropriate compliance plans and delayed installation of less polluting technology and practices. In January 2001, Channelkeeper and the Environmental Defense Center (EDC) stepped in and filed lawsuits against Halaco in state and federal court in an effort to force the company to clean up its mess. Halaco tried everything to evade our lawsuit, including attempting to have our suit dismissed, filing a bogus trespass lawsuit against Channelkeeper’s Executive Director, and filing for bankruptcy. These efforts failed to deter us. After years of haggling, Halaco finally agreed to a settlement with Channelkeeper and EDC. The settlement required Halaco to cease discharging contaminated wastewater to the settling ponds, stop adding solid waste to the slag heap, implement stormwater runoff control measures, and install air pollution monitoring and control technology. The settlement agreement also required Halaco to hire a consultant to monitor the company’s compliance and to submit to random sampling of its air emissions. The latter point proved to be Halaco’s death knell. Air emissions testing conducted in 2004 revealed that the notorious polluter was violating its probation by exceeding the limits of its air pollution permit. Because the company was in bankruptcy, it could not afford to take the measures necessary to come back into compliance with its permit, and Halaco was forced to permanently cease operating in September 2004. While this was a major victory for the community as well as the Ormond Beach Wetland since Halaco would no longer continue to actively pollute the air and water, its legacy unfortunately lives on in the 40-foot high, 26-acre mountain of toxic slag Halaco built up over the years and left behind. Fortunately, in 2006 EPA finally stepped in to remove some of the most immediate environmental threats and conduct an in-depth assessment of the contamination at the site. EPA took hundreds of soil samples from the waste pile, smelter site and surrounding neighborhoods, as well as sediment, groundwater, surface water, air and fish tissue samples at the site and within the estuary. They also analyzed sand at Ormond Beach as well as offshore sandbars for radioactive isotopes in order to determine if contamination has migrated offshore. At that time, EPA also removed all drums and other containers of hazardous substances, consolidated loose waste material, secured the property with fencing and signage, and took other steps to improve site security and stabilize the waste on-site. EPA’s sampling confirmed extensive contamination at the Halaco facility. Compounds found include aluminum, arsenic, barium, beryllium, cadmium, chromium, copper, lead, magnesium, manganese, nickel, silver, zinc, cesium-137, potassium-40, thorium-228, thorium-230 and thorium-232. EPA also found evidence that wastes from the Halaco facility have moved into the adjacent beach and wetlands, sediments in the adjacent Oxnard Industrial Drain, and underlying groundwater. Limited sampling in a nearby residential area did not show elevated levels of site contaminants. Based on their findings, EPA recommended that the site be added to the Superfund National Priorities List, which is reserved for the nation’s highest priority hazardous waste sites. That listing was approved, with Channelkeeper’s full support, in September 2007. Since then, EPA has undertaken various measures to remove some of the most hazardous waste, stabilize the slag heap to reduce stormwater runoff and erosion, and determine the nature and extent of the contamination through extensive sampling. In 2011-2012, EPA released a series of reports describing the results of soil, sediment, and water testing done in 2009-2010. (Click here to view the reports and learn more about EPA’s actions related to the Halaco clean-up.) 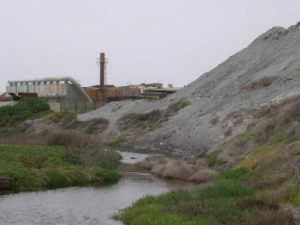 Their reports show high concentrations of metals and other contaminants in sediments in and around the slag heap, the former smelter site, the Ormond Beach lagoon, in the neighboring Nature Conservancy property, and in the Oxnard Industrial Drain. It also found that Halaco’s operations have contaminated shallow groundwater underlying the area. As part of its Superfund remedial investigation, EPA is evaluating the feasibility and cost of using Halaco’s wastes as a raw material in the production of cement. EPA plans to release the results of this evaluation as well as an ecological risk assessment report in 2013. The agency will then release a proposed clean-up plan for public comment. After public comment on the proposal is taken into account, a Record of Decision will be developed to explain which clean-up alternative(s) will be used. The Record of Decision will be followed by the Remedial Design, which lays out the technical specifications for clean-up remedies and technologies, and then the Remedial Action – the actual construction or implementation phase of the clean-up. The timeline is uncertain but will undoubtedly be several years, and the clean-up is likely to cost tens of millions of dollars. In our ongoing efforts to secure a timely and thorough clean-up of the Halaco site, Channelkeeper is working to ensure that the local community understands and participates in the complex and highly technical Superfund clean-up process. Channelkeeper secured a Technical Assistance Grant from EPA and is using the funds to contract the services of Geosyntec, an environmental consulting firm, to help us review, analyze and translate into layperson’s terms the technical documents generated by EPA as part of the Superfund process. We will leverage Geosyntec’s technical assistance to help local citizens understand EPA’s findings and clean-up proposal. We’ve formed a coalition of local groups to help us reach, educate and engage as wide a swath of the community as possible so that their concerns and desires regarding the clean-up and future uses of the site are considered by EPA when making decisions about the final remedy for the mess Halaco left behind.